Okay, so here’s how the D&D campaign ended (plus a little background for folks out of the loop): Since early in the campaign, the eastern group of continents (where all our characters have lived and adventured) have been under attack from these creatures we’ve labeled “hollow-men.” The reason for this moniker is that, when opened, it becomes apparent that there is nothing inside their ubiquitous banded armor. In fact, the armor itself is magical and, when forcibly put on a living humanoid, turns the wearer into one of these mindless soldiers. Thus, the hollow-men army has grown as it’s swept the eastern lands, with our own captured units eventually being turned against us (à la the Borg, or infectious zombies). Now, most of the major gods in this campaign had been in a state of suspended animation for many years, imprisoned in corporeal forms not quite dead. These avatars were hidden in various dungeons and labyrinths throughout the eastern continents. We’d been waking them up, having been promised that when a dozen were active at once they could use their divine powers to conquer the hollow-men scourge. But while we were carrying out this mission a cadre of elite wizards (the “blue-cloaks,” who were employed by–or at least had intentions similar to–the hollow-men army’s rulers) worked to undo our efforts and prevent us from raising new avatars. Anyway, near the beginning of the last session we were bringing the ship into New Avalosa for repairs, loot liquidation, and resupply. Upon arrival, we found a large scale naval battle underway outside the island’s harbor. We traded in the airship for a much smaller and slightly slower (but completely undamaged) skiff, then spent a few days helping defend the tiny nation. Long story short, we managed to take out 16 enemy ships with spells and archers. Then we headed north to a dungeon where it seemed likely another avatar was being held (these spots were marked on a huge map we acquired at a similar complex that we happened upon by accident back around the third session). The entrance to this one was a partially submerged cave mouth on the other side of an estuary from a tribe of cannibals. Inside, we met a glass or crystal golem (which I demolished with a single critical hit) and a group of goblinoids ruled by an ogre mage. Beyond those chambers, we found a huge cavern with large pillars protruding hundreds of feet from what seemed to be a brackish underground lake. Beyond that, there was a clever illusion, a sort of moai-ish guardian, and a room with five doors and a disembodied voice. We all took different doors. Brandon and I ended up sliding down a chute into a room dominated by a giant blue man in shackles. The others were sent to a variety of strange worlds or planes; two appeared in a land identical to ours, but where everything was made of metals. Another two found themselves on the astral plane, where they were chased by some sort of ethereal dragon. It developed that the blue giant was actually an imprisoned djinn. By promising the djinn that we would use the last one to free it, we were allowed to make three wishes. Knowing that these wishes would most likely interpreted with maximum prejudice, I tried to make them as altruistic and simple as possible. I wished that (1) all our party members would appear in this chamber, completely safe, (2) that all the hollow-men would revert to the form they had before the armor was put on them, and (3) that the djinn would be free to do anything he wanted. Sure, they weren’t perfect wishes, but I had to say them before Brandon or the other party members could start weasling in on ‘em. After that, things moved faster — the hollow-men were reduced to bloody blobs (due to a very technical interpretation of the wish) and our party took a massive force to the distant western continent with an impressive Avalosan aerial dreadnought as our flagship. We were each assigned a company of soldiers (I got archers) to destroy the hollow-men armor forges and a couple guardian dragons. It turned out the people responsible for the invasion were the duergar. I don’t think their race was quite the same as the typical D&D one (i.e. gray dwarves who lived near the drow); these ones were green and seemed to be slightly injured by direct sunlight. Anyway, we eventually arranged talks to negotiate their surrender and many things became clear: Apparently their rationale for the enitre invasion was that their race ruled the entire planet long before any of ours existed, so they were entitled to it. So devout were they in this belief that their mature males actually willingly donned the armor, despite the fact that it robs the wearer of free will. At the talks, they refused to surrender; they unequivocally said they would continue to try to take back their land no matter what we did. Anyway, Anthony and I argued for quite a while until it became evident that neither of us could change the other’s mind. I tried to appeal to the other players and the admiral NPC, but no one would accept anything other than New Avalosa’s “Endlösung der Duergarfrage.” So, with the campaign drawing to a close (and our characters destined to retire to NPCdom), I told the GM that Kreft (my elven archer) would gather all the resources he could and lead an insurgency against the New Avalosans. I figure he’ll be a definite thorn in their side while they try to execute 90% of the western menace; I’d cultivated relationships with a fair number of influential NPCs during the campaign and amassed a decent amount of equity (more than anyone else in the party I think, when you include the castle I was granted thanks to my single Deck of Many Things draw back in the hidden valley so many months ago). Plus it shouldn’t be hard to get the duergar on my side, at least until the extermination can be halted. And, while we’re organizing this resistance, perhaps I can convince the western continent natives that they should be content with controlling only half the world. Anthony said his thief would keep on with the military, trying to eradicate my character’s covert cells. The next D&D campaign (which will be run on Friday nights) will take place in the same setting, but 10-20 years after the events of the last session. As a way of commemorating my time in the campaign (May 22nd – September 18th, 16 sessions), I decided to post the main two pages of my character sheet. I had other stuff to talk about, but this post has gotten pretty long so I’ll just write another one later. One quick note though: I wanted to mention I’m leaving for the Tri-Cities in a few minutes — I’ll be there till Monday. Post #720! Bound to be twice as good as post #360. Right? Of course. ‘Course, I’m not sure I trust this site’s analysis — I scored only 1% on morality. WTF, I have decent morals. I mean, I might not pay for every song I download, but it’s not like I’m out there drowning kittens or accepting money from Jack Abramoff. Anyway, if you take the test, post your results URL in the comments. I’d like to see what other people scored. I just got back from a Game-A-Lot all-nighter… a bunch of guys were there; Josh, Charlie and his girlfriend, Ashley, Derek, Doug, Logan, and this new guy, David. David’s a marine who’s on leave in Fed Way; he just stopped into Game-A-Lot to play some video games, but we got him to play some Magic and Settlers of Catan. Cool guy. We had a big Settlers game — I would’ve won if Josh/Doug’s political machinations hadn’t prematurely nixed my trading options. As it was, Josh should have won (he had 9 points, plus a 1-point development card), but he deferred a turn or two and Derek seized the opportunity. After that, we played a game of emperor Magic (Charlie, Ashley, and Logan vs. me, Josh, and Derek). It was pretty epic. Basically, Ashley would’ve stomped me with these huge green crits, but the turn before I was to die I managed to get out a Platinum Angel with Aether Vial and attach Whispersilk Cloak to it (I was playing Logan’s angel deck). Thus, I couldn’t lose the game, even though my life total dropped into the negatives and Logan decked me. I actually managed to kill Ashley, but couldn’t attack after that due to Charlie’s War Tax enchantment. But eventually Logan was able to bounce the Whispersilk and the Angel, which made me lose instantly. I really wish I’d remembered to bring my Magic collection back with me. All my decks were stolen, but I think I could’ve cobbled together something competitive. These Game-A-Lot nights have gotten me jazzed about the game again; been playing a lot of MTGO (mostly my Supersteal deck and Momir Basic). Justin’s in the Tri-Cities this week. I can’t go down for a variety of reasons, so I was trying to convince them to drive up here for a day or two. No luck though. Oh well, sorry I missed you, Justin! Hopefully we can meet up the next time you’re next on this side of the country — Thanksgiving or Christmas maybe. My dad gave me some arthritis medicine for Looker. I hadn’t noticed anything wrong with her gait, but it must’ve been there because now she’s way more energetic. 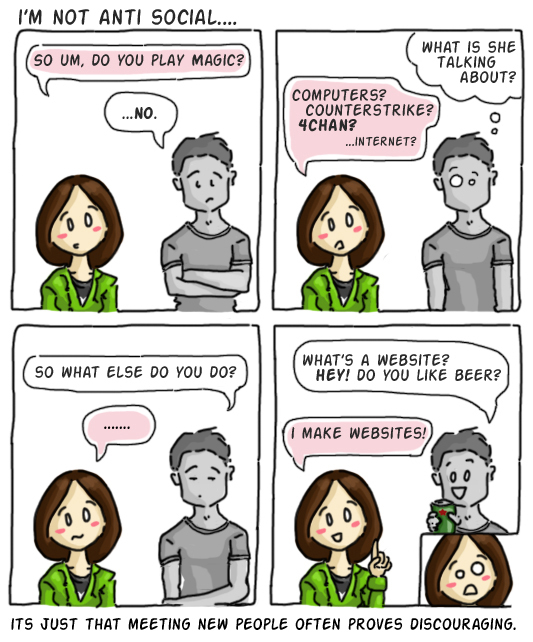 I don’t know who did this little comic, but I thought it was pretty funny. I’m sure some of you can relate. Gah, I gotta eat something… seems like whenever I drink coffee on an empty stomach I feel like I’m going to throw up a few hours later. Hey, did you know parfait means “perfect” in French? I just learned that today. Next post: D&D campaign summary and epilogue. I went to the Tri-Cities this weekend (left Thursday morning). It was a lot of fun. Got to see my parents and Jones, Paige, and Beefy. I stayed in the indoor arena apartment this time… It’s weird, but for some reason I always sleep really well on the futon up there, even though the cushion seems way too firm. General summary of events: GMed a lot of d20 Modern, helped my dad with some stuff (hung a gate, took stuff to the dump), played some new card games, got comics and RPG stuff at Infinite Frontiers, guest hosted on Beefy’s podcast, made our own Apples to Apples decks, read a lot of The Mote in God’s Eye (about two-thirds through now), and got a messenger bag. The new card games we tried were Mag Blast, King’s Blood, and Guillotine. Mag Blast was okay, but too much of the game depends on luck — victory is like 15% strategy, 85% chance. King’s Blood was fun, though the rules are a little cryptic — on the first read-through it seems overly complex. But it’s really just a dressed up version of Uno. And I don’t have much to say about Guillotine… it’s good in small doses, or as a warm-up game since it’s so simple. I drove back to Fed Way around noon to attend Chris’s Monday D&D game. Major events unfolded tonight. So much happened that I’ll have to do another post later just to explain it all. The big news is that the current campaign came to an end. Our characters are being retired and will likely appear in the next campaign (same setting, about 10-20 years later) as NPCs. It’s no fluke that this coincides with Chris’s game moving to Friday nights (meaning we’ll lose a couple players). But after spending the last several months waking avatars and fighting the hollow-men, I’m ready for a change of pace. I’ll have to post Kreft’s character sheet here to commemorate his awesome archery abilities. On the trip here, I listened to the Zombie Survival Guide audiobook. It’s surprisingly serious about the subject matter. I expected some jokes, maybe some short stories. Nope. But it still manages to be interesting, provided you’re a zombie nut (like me). Here’s something I was working on in SketchUp earlier this evening. It’s a section of a zero-gee structure meant to spin for artificial gravity. I was thinking about some of the issues with O’Neill cylinder (internal) architecture and decided to do a 3D mockup to clarify some things for myself. Isn’t it strange how the doors on the spin-plane have to be wedge-shaped while the perpendicular ones are normal? And then the walls are the opposite — spin-plane walls are of the same thickness throughout, but when rotated 90 degrees their bases have to widen to appear “vertical” from the perspective of the cylinder’s inhabitants. Some good news on the whole car-break-in thing: I got my Pontiac back from Jim’s Auto Refinishing today. (They’re really awesome, BTW — super helpful. They even cleaned, vacuumed, and washed my car for me!) Also, the manager at Steel Lake Plaza, an apartment complex over on 312th St., called me and said she had some of my books. Turns out she had the entire contents of my briefcase — my clipboard, character sheet, all four of my D&D books, the little plastic tub containing all my favorite dice, my notebook (with the party treasury and Bag of Holding inventory), and all my papers. I was pretty glad to see that stuff again. 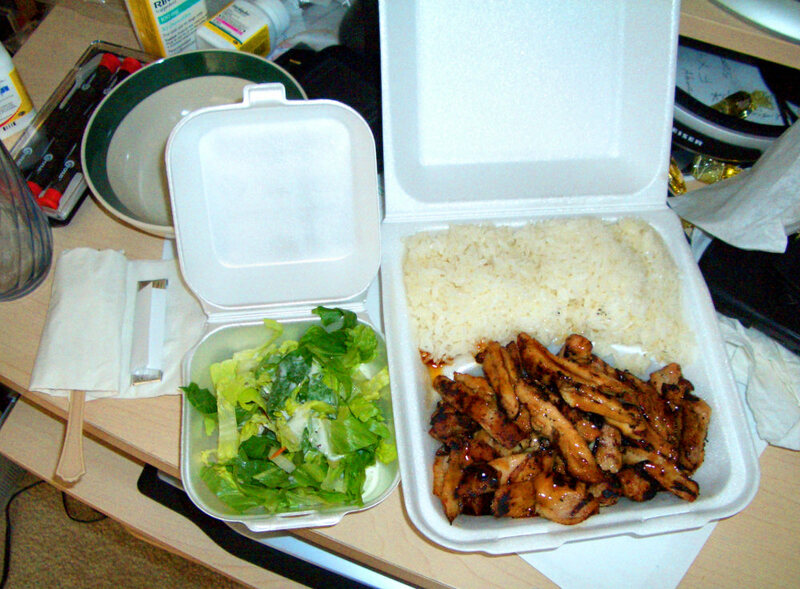 Last Saturday, Brett and I had lunch at Bangkok Garden (over by the Barnes & Noble). We both had the pad thai. It was really good, though a little spicier than I was expecting. I think it was slightly better than the pad thai we had at Noodle Ranch in Seattle, though theirs was also very tasty. There was so much of it, I was barely able to finish it myself. I’m 170 pages into The Mote in God’s Eye now. The first few chapters were really slow, but it started getting much more interesting after the crew of the MacArthur encountered the first alien from the Mote. The book’s much longer than I’d expected; about 560 pages. At first glance, I’d assumed it was only 300 or so. After this, I plan to read Greg Egan’s Schild’s Ladder, which just arrived in the mail last Thursday. Been playing a lot of Magic Online lately. I’ve really fine-tuned my mono-blue thief deck. The Dissension set introduced a fantastic sorcery that’s been a great addition — Govern the Guildless. Here’s the current “Supersteal” decklist if anyone wants to check it out. Oh, and MTGO’s new “Momir Basic” format is amazingly fun. Essentially, you make up a deck of basic lands, then get to summon a random creature with a converted mana cost equal to whatever you could generate. All you need to play is 60 lands and the Momir Vig avatar (which only costs about 4 or 5 tickets). And the random creatures are drawn from pool of every magic card ever printed — even stuff from Alliances, Revised, etc. that isn’t normally available on MTGO. Some piece of human garbage broke into my car last night. 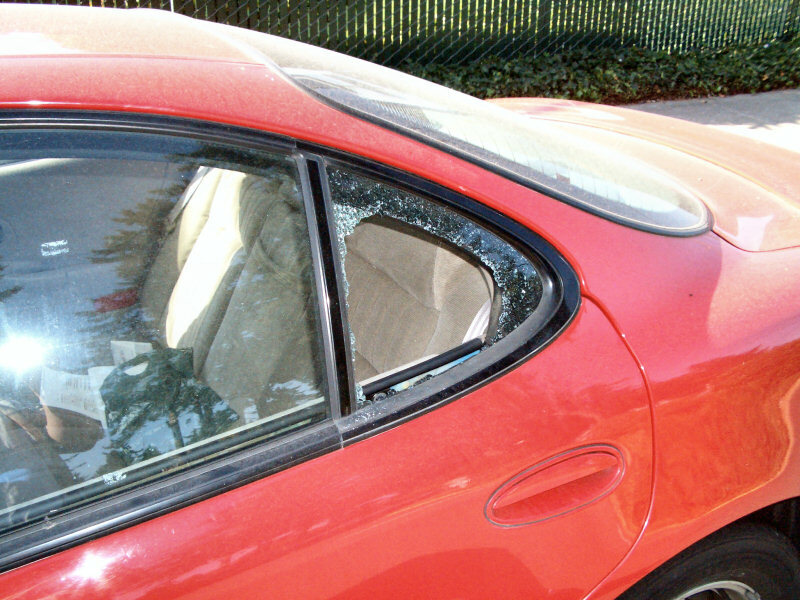 They punched out the rear partition of the driver’s side backseat window and stole a bunch of stuff. They took my D&D books and dice (and the briefcase I kept them in — a Christmas present from my grandma), my backpack with my GURPS books in it, my Settlers of Catan game, all my Magic decks, a checkbook, and my CD case (which had a bunch of comedy and audiobook discs in it). 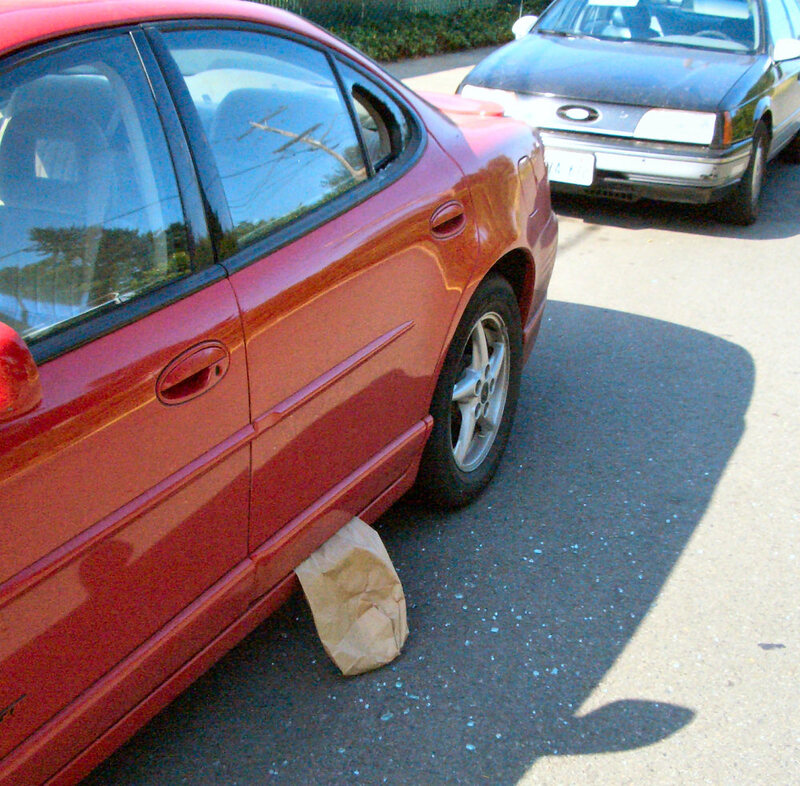 Anyway, I filled out a police report and made arrangements with the insurance company. Also had to close out my checking account with the bank and open a new one (and order new checks). 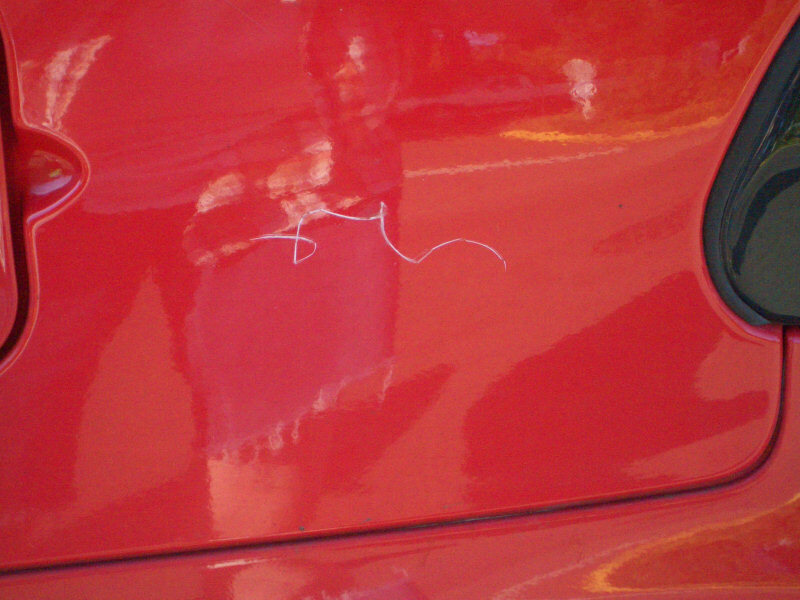 Dropped the car off at Jim’s Auto Refinishing this afternoon… looks like it’s going to cost about $770 to fix. At least my deductible on that is only $100. A girl called me earlier — she’d found some of my GURPS books lying in the street near the Best Western. (Glad I wrote my name and number in the front of them.) I picked them up from the jewelry shop next to Game-A-Lot, where she was kind enough to leave them for me. They’re really beat up — looks like they got run over a couple times. I got back Characters, Campaigns, and Alternate Earths… looks like my Infinite Worlds sourcebook didn’t make it. Needless to say, I’m pretty steamed over the whole ordeal. The loss of all my Magic decks probably hurts the most; many of the cards in those were from when I first started collecting, back when Revised was the latest set. Underground Sea, Coat of Arms, Lord of the Undead — there were a lot of great rares in there. I’ll begin this post with a couple recent items that were a source of bountiful delight to me. Number A: On Sunday night it was revealed to me that Paige (Paige!) is a b-tard. For those of you not in-the-know, that might sound like an insult. But quite the contrary: It simply means she frequents 4chan’s “random” imageboard. In fact, over the past week I’d actually seen some posts that made me think, “OMG, that looks like something Paige would write!” And lo and behold, I asked Jones (who asked Paige) and it was confirmed that she was the true author. A funny coincidence, for sure. Anyway, after that I saw some guys setting up The Game of Life. I’d seen them at the store before; they often played Magic in the evenings while Chris’ D&D game was going. I aksed if they wanted a fourth player and, thus, I was introduced to Josh, Leah, and white-Anthony (a designation I’ll use here to distinguish him from Korean-Anthony, who runs Game-A-Lot). I think Josh won with about 2.1 million dollars; I came in second with 1.6 million. (How sick is it that Hasbro measures your success in life by the amount money you accrue?) After that we played a couple games of Settlers of Catan, then some Magic. During this time, I met Steve-O (a mechanic, not the celebrity) and Logan. Then today I got a call from Josh and a bunch of us met up at Game-A-Lot for Settlers of Catan and Magic. This time, I also met Charlie and Doug. They’re all awesome people — the sort who quote Jay & Silent Bob Strike Back, get excited by clever Magic card combos, and play every game with cutthroat win-at-all-costs tactics. I was having some problems with my site in Opera — apparently a change in the 9.01 version of the browser made it handle certain CSS properties differently, such that the “Previous Entries” link at the bottom of each of my blog pages became unclickable. The talented Filosofo and HandySolo helped me fix it in this thread, over at the WordPress.org support forum. This site, “The Joint,” is a virtual building filled with rooms designed (and sometimes animated) by different users in a isometric/pixel-art style. Apparently you can submit your own rooms. I made some “stripy wallpapers” for my desktop and organized my favorite ones on this page, along with a tutorial for people who’d like to make their own. It’s also linked off the sidebar under the “Stuff” section. 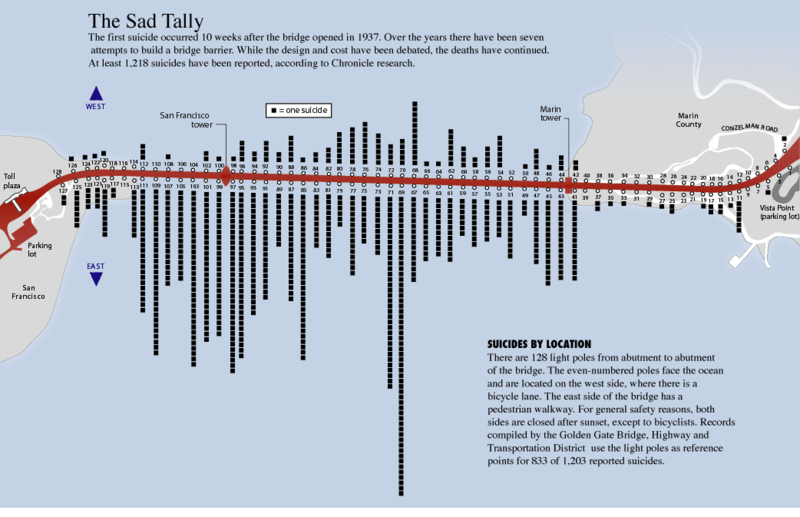 Here, enjoy these Golden Gate Bridge suicide statistics. You are currently browsing the Upsidaisium.com weblog archives for September, 2006.